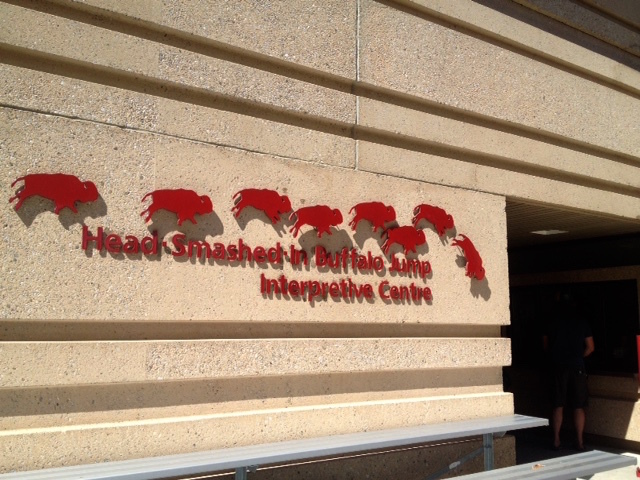 Head-Smashed-in Buffalo Jump…. 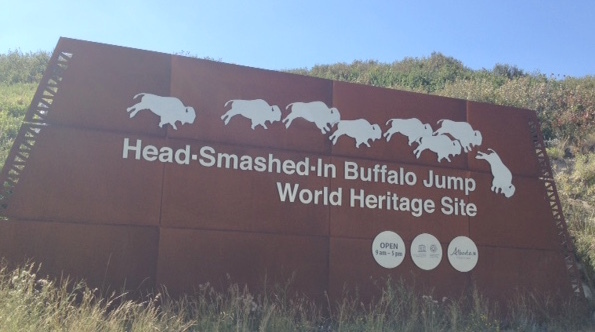 for a minute you wonder who is smashing whose head and that too over jumping Buffalo or Bison and then you realize that this is one of the ‘world’s oldest, largest, and best preserved buffalo jumps’. It is not literally a jump but a 6000-year-old indigenous method of hunting unsuspecting buffalo who ‘jumped’ over a cliff to the plain below, to their death. 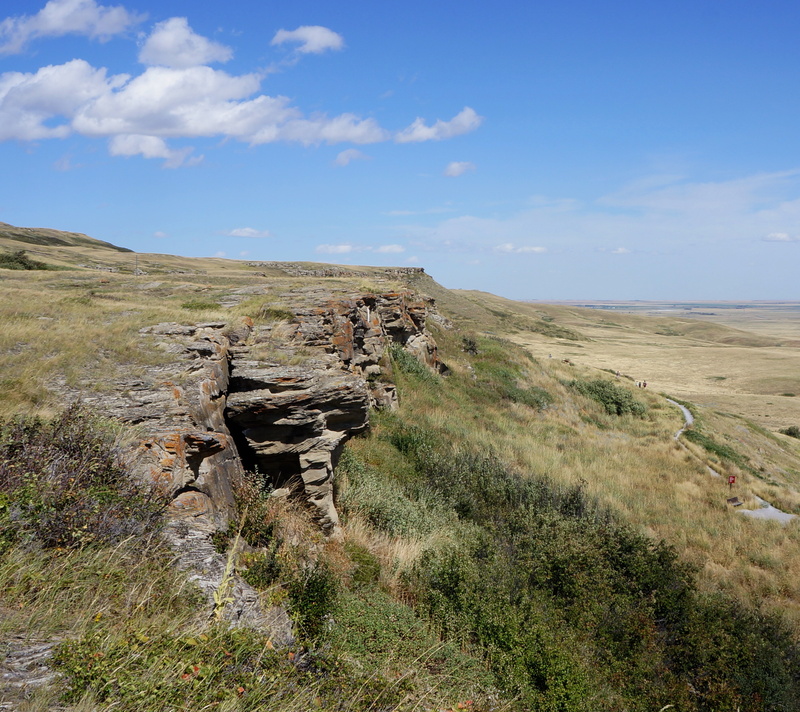 Head-Smashed-In Buffalo Jump or Estipah-skikikini-kots site is on the foothills of the Rocky Mountains at end of the prairies of Alberta and Montana (across the border). It was a Blackfoot (tribe) food-back-up-supply (depot) to round-up buffalo/bison from their grazing areas in the Porcupine hills and driven along drive lanes to edge of cliff by specialized buffalo-runners dressed as coyotes and wolf. The petrified herd galloped at full speed, unaware of impending doom, to fall down the 300 meters high cliff to immobility and death. The carcasses were dragged to the camp and butchered into pieces with every part and entail used for different purposes. Sometimes human error resulted in death or injury to the hunters, as one learns from the tale of a Blackfoot youth who had got caught in the wave of falling animals and found with his head smashed, under the pile of carcass. A walk to this World Heritage Site (United Nations Educational Scientific and Cultural Organization in 1981) on a blustery windy day is a lesson in history of the Plains People and their courage and fortitude, of hardships endured to subsist on the vast herds of buffalo/bison that existed in North America, of their understanding of buffalo and predator behavior, notably wolf and coyotes, and of life before guns and horses. 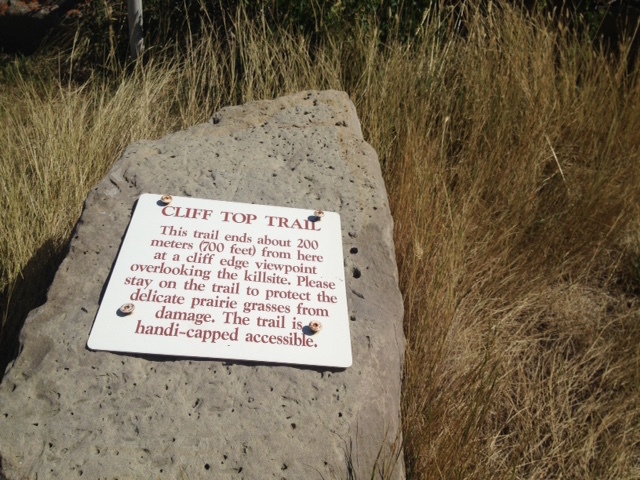 One can hike up the lower trail, from the car park area, up to the base of the bluff where the buffalo fell. The place has since filled up with growth and earth but one can visualise the steep fall. The Site was abandoned in the 19th century after contact with Europeans and was later discovered, in 1880s, by Europeans and excavated by the American Museum of Natural History in 1938. We preferred the second option of walking the upper trail from top floor of the Visitor Center and then walked back five floors for the exhibits and the cafeteria. 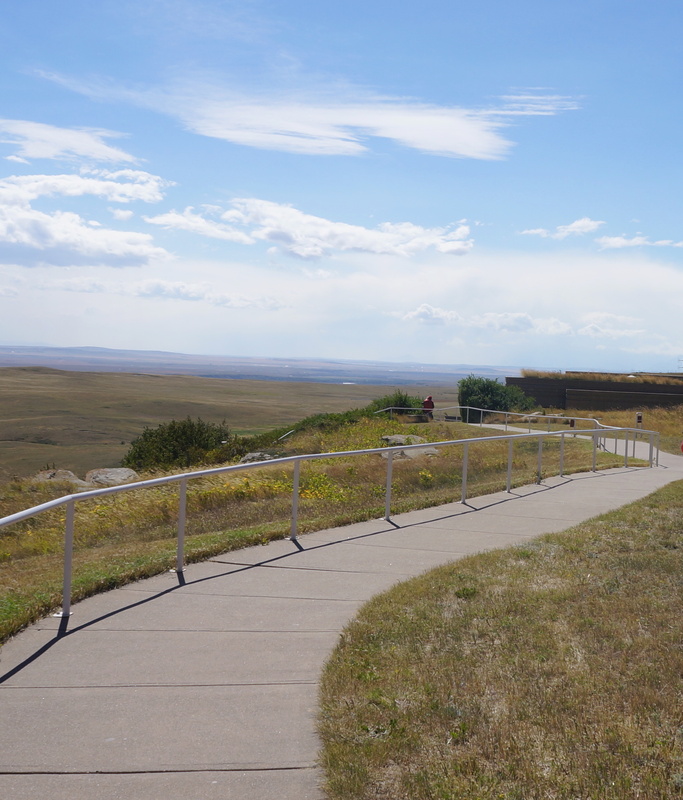 The Interpretative Centre, opened in 1987, is built into the sandstone bluffs of Porcupine Hills merging with the landscape of prairie grasslands to give visitors a feel of the past. The Center showcases archeological evidences highlighting the ecology, mythology, lifestyle and technology of Blackfoot people. 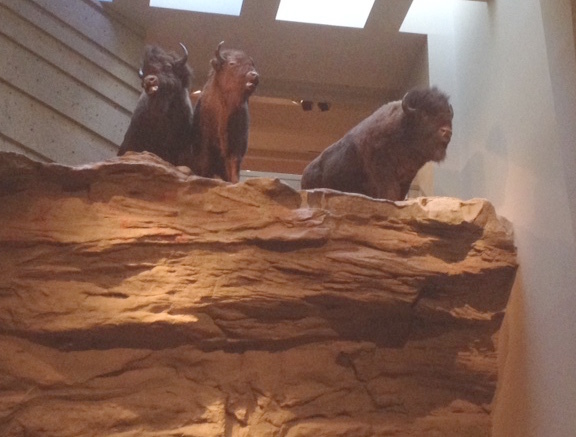 The exhibits and the 16-minute narration by a native boy, of his dreams and participation in an actual hunt, is a gripping presentation of erudite technique connecting spiritual ceremony (performed by medicine women and men for a safe and successful hunt), with preparations of ‘buffalo runners’ to locate and herd the animals to the cliff site, the involvement of entire camp in setting up ingenious V-shaped drive lanes snaking their way through ridges, crossing coulees and rising across the tops of high hills to end at the cliff from where there was no turning back. It is a story of courage, of hardship and survival instincts of both humans and animals. 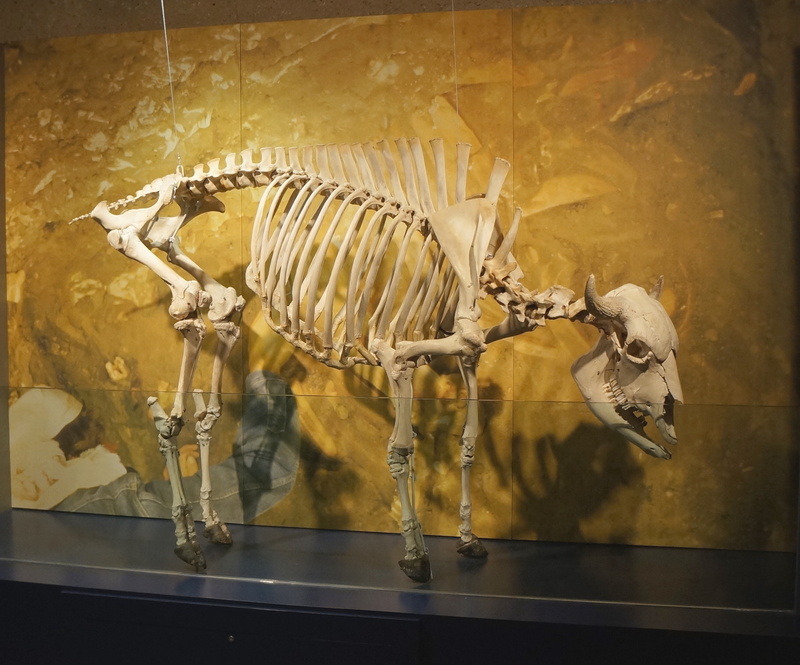 Particularly poignant is the killing of maimed buffalo as Native People believed that escaping animals would warn other herds of the deadly trap. A successful hunt brought in food, dried meat, pemmican, fat supplements from the bones, tanned hides for clothing and dwelling and tools from bones collected. Almost every body part of the animal used to last the extreme winter conditions when the tribe moved to safer regions along the Old Man River and the valleys beyond. .
Chastened and clued-up we followed the steps down to the Tipi exhibit and finally to ground floor at the bottom of a life-size diorama to click selfies where the buffalo (bison) seem tragically close to falling on your head. Another must watch is the permanent exhibition, Lost Identities: A Journey of Rediscovery, a collaboration of historical societies and museums. 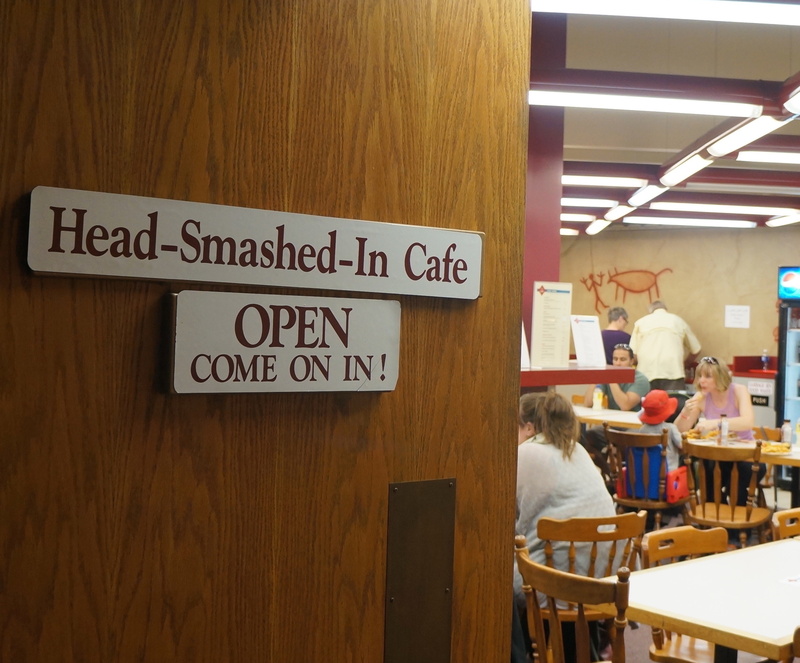 We spent sometime at the Cafeteria refreshing ourselves with coffee and apple pie. No bison burgers after watching their butchering. While waiting for family to catch up, chatted with a Native, working at Center. He had greeted us at entrance with a ‘Namaste’ (Indian greeting) acknowledging that ‘we are both Indians, one from the West and the other from East’. His words, ‘India and China had the numbers to claim their land, whereas, his people are just spectators of happenings around’ sounded of lost opportunities. I did not want to show my ignorance of the political and social history of the First Nation and Native Americans and nodded acquiescence to his statements adding my one sentence that ‘maybe they needed a Mahatma Gandhi or a Sun Yat-sen to guide them to channelize their resources’. He smiled. ‘A head-smashing photo-shoot moment’. *To get there. From Calgary head south on Hwy. 2 for about 160 km. 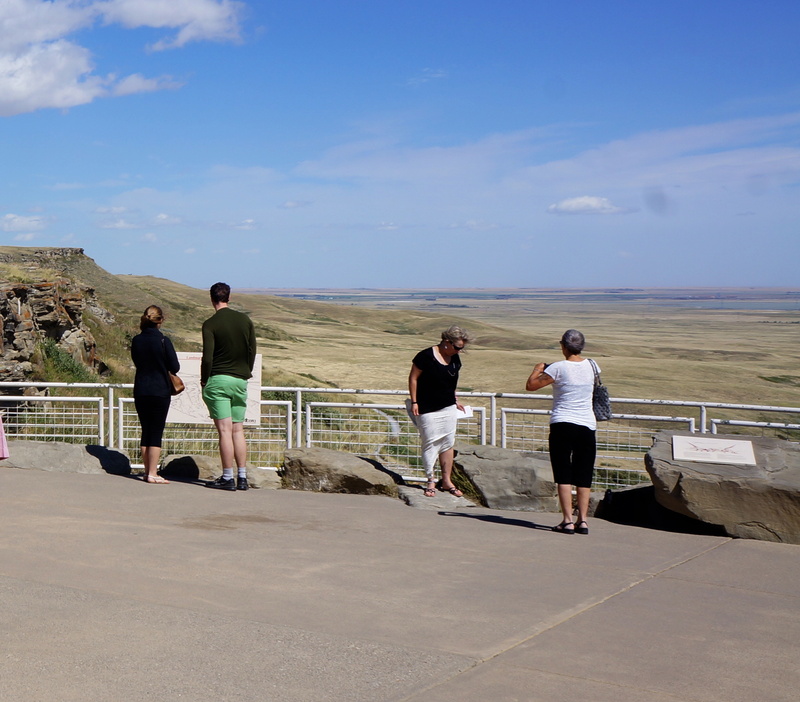 till you see the signs for Head-Smashed-In Buffalo Jump and Hwy. 785 West. The turnoff for Hwy 785 is about one km north of the major intersection with Highway 3. 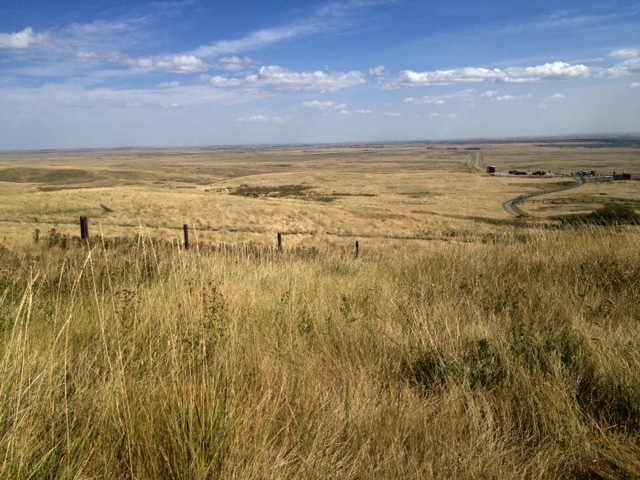 The Site is located 18 kilometres (15 minutes) north and west of Fort Macleod. Head Smashing post – amazing to see the kind of practices that have existed in different parts of the world.